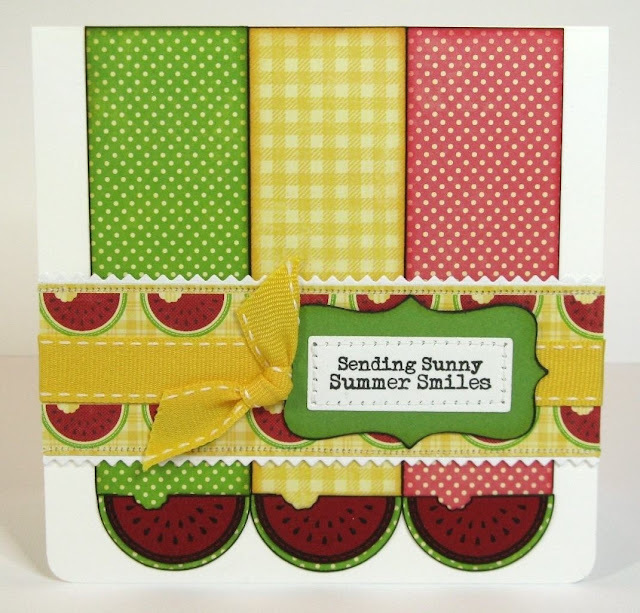 Today I am sharing one of two Jillibean Soup cards I submitted using their fun and happy Watermelon Gazpacho Soup collection. Using these papers inspired me to pull out the matching stamp set by Unity Stamp Co. that I had purchased awhile back (found here) which had never seen ink. I used the watermelon image from the set to form 3 scallops that continued from the 3 strips of patterned paper. I punched slightly larger circles out of the green polka-dot to form a contrasting rind which I traced with a black sharpie over scratch paper to give the matching outlined look of the stamped image. The Bracket label is a Quickutz die, the ric-rac trim was cut using a border die by Papertrey ink and the yellow ribbon is some Pebbles Inc. ribbon from my stash. Thanks so much for hanging with me today! Make sure to check back tomorrow when I share my first set of projects made using Lori Whitlock's super fun Halloween shape files!!! This is just beautiful Mendi!